Coroico tours don’t only consist of nature related adventures. You can spend a few days in Coroico just relaxing, enjoying the pool and sun, and tasting the wonderful local and international fare at Coroico’s restaurants and pubs, most of which are located on or near the main plaza or in Coroico Hotels. If you have questions visit our Coroico Travel Forum. Panorama: In Coroico the spectacular mountain and valley views are themselves are the main attraction. Even if you did nothing else but stare off into the distance while sipping a cup of the teas and coffees Coroico is famous for, your trip will have been worthwhile. Swimming and Rafting: Coroico was initially established near the Kory Huayco River, then moved to the top of the mountain where it now sits. In the nearby rivers such as Rio San Juan and Rio Coroico you can swim or do some rafting in the Huarinillas River. Waterfalls: Visit Perolani waterfalls near the Afro-Bolivian community of Tocaña. 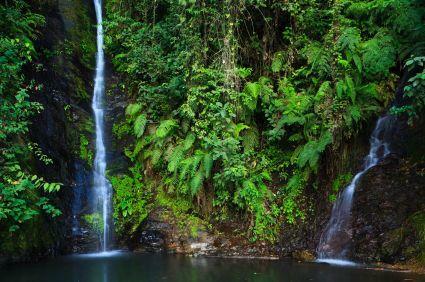 Pozas del Vagante is an area of small waterfalls and natural pools. Paradise Falls in Supay Punku are very remote. You need a Coroico tour guide to see them. Hiking: Hiking is very popular in this region. In Coroico tours offer hikes around the area. Guides explain the history of the region, point out local birds and wildlife, and show you some of the plantations Coroico is known for, especially its coca, coffees and teas. Trekking: If you like more adventure and are in good shape, you can take a long 3-4 day trek along the Chora Inca trail or the Kory Wayku Inca trail, two ancient stone walking paths built hundreds of years ago when the Incas reigned over the region. The Urpuma trail was also used for centuries. Biking: You can rent bikes by the hour or day at Hotel Bella Vista and bike around the area. You can also take mountain biking tours of Coroico. If you’re really adventurous consider biking Death Road with a tour from La Paz to Coroico. Horseback riding: If you’re not into hiking or long treks, you can see the sites from atop a sturdy horse who will do all the physical work for you while you enjoy taking photographs. Communities: Visit nearby communities like Charobamba (established by Jews escaping Nazi Germany) or Tocaña (an Afro-Bolivian community established by former slaves who gave Bolivia its famous “saya” dance.) Yolosa is a small town where most Death Road biking tours end. Coroico Viejo is where Coroico was originally established before indigenous attacks caused the inhabitants to move their town. Hacienda and Plantations: You can visit coffee, tea, coca, bananas, and citrus fruit plantations in the area to learn about local agriculture and try some of the products. Cotapata National Park: Bolivia has a wealth of national parks, reserves and protected natural areas and is home to 40% of the world’s known wildlife. Located near Coroico, Cotapata is the small but beautiful home to great diversity of ecosystems and is believed to be the most biodiverse region on Earth. Rock Paintings: The Kellkata Petroglyphs are located near Santa Rosa de Kilo Kilo, about 3 hours from Coroico. Tour guides are a must. Senda Verde Animal Refuge: This ecotourism retreat is sometimes a part of Coroico tours and offers you the chance to see some of Bolivia’s amazing birds and wildlife without having to actually trek into the jungle. You can also volunteer here.